A little different . . . I duecided to take a break from paper-piecing isosceles triangles when I had finished 92. So I sewed together two tops for making into quilts for our Children’s Quilt Project wing of EBHQ’s Community Quilts efforts. I made these tops from kits I made for the Project using my all-time favorites—the leftover 2″ squares. Kits kinda come together on their own. Scraps cut into 2.5″ squares begin to combine into interesting groups or color combinations, and these groups find fun borders and binding. I love this process. Sometimes, when I create a kit, I can’t let go of it and HAVE to make it myself. Then, I usually finish the whole quilt. And it does still feel good to know that some child/family will receive this quilt. I know they really appreciate these cuddly comfort quilts that our guild donates to a wide variety of deserving non-profits. Still have three more kits that I could sew now, but I think it’s time to get those last 40 triangles sewn (if they actually ARE the last triangles; I almost never know). Woven Hexagons is finished. This quilt is the final product of the sewing project I had to start in Ashland OR, when I inadvertently left my sewing basket at home when I left on vacation almost two years ago. 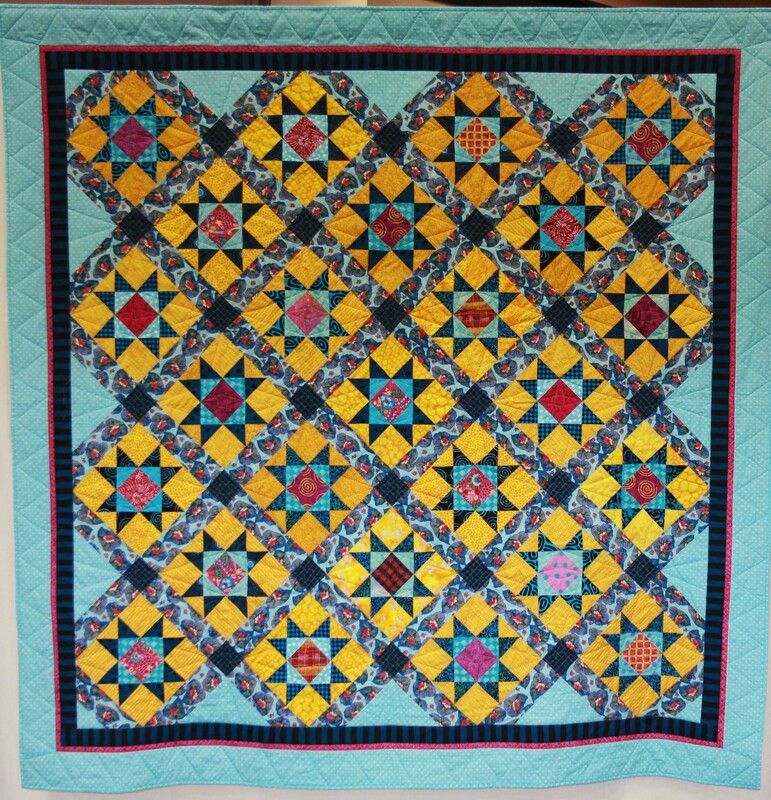 Click here to see the full story, including details about the English paper piecing techniques used. It was difficult finding a background for all these great blocks, and I was surprised that this really bold-printed pattern on black was the one that finally did the trick. Frankly, working with this entire color palette put me way out of my comfort zone, so I am pleased that it is finished and that I like it so much. 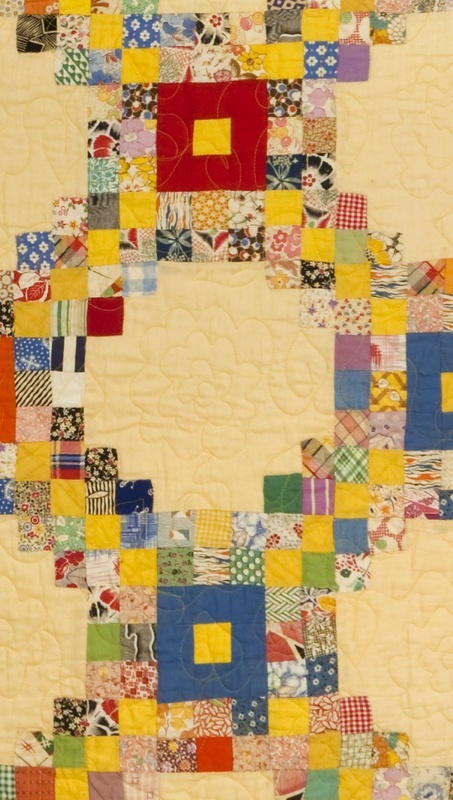 The quilting is very simple; it is hard to see as it is, so just enough quilting to hold it all together, including the fun circles in the middle of each block. it’s a challenge to make a quilt using only fabric from one designer or fabric line without the final project being uninteresting, so using only Marcia Derse fabrics for this one posed some problems. In the end, I hope it hasn’t turned out too boring. Surprise, surprise. . . . I just can’t stop playing with these bright, bold, geometric fabrics that I first began to put together when taking the Freddy Moran Parts Department class (see previous post about the Happy Quilt). So I made Happy Quilt II, because I still had more of these strata leftover (hooorrraaaaaay for leftovers!!). And the yellow background fabric in this quilt in between the rows of strips reminds me of another quilt of mine, Yellow Rows of Seven. 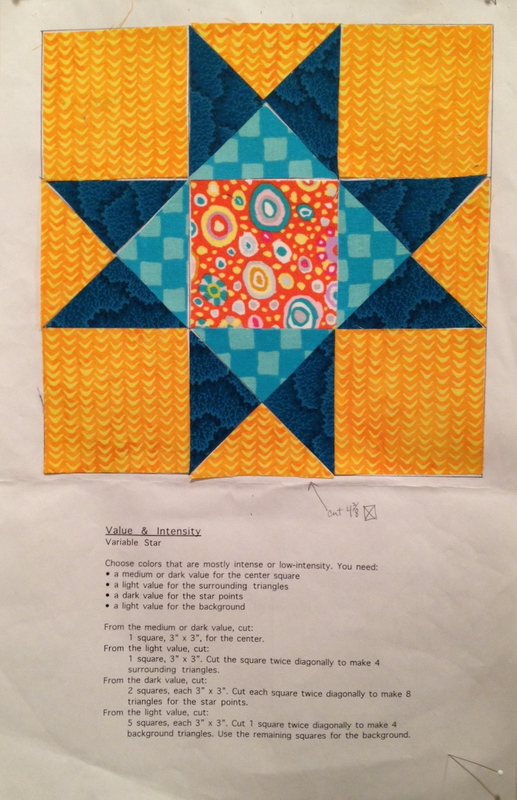 When I started quilting a thousand years ago, people did not favor yellow and orange, thinking they were too bold and difficult to work in with other colors. So it feels as though I have come full circle now, loving yellow and orange equally with all the other colors. And I had fun doing a very simple quilting pattern on this quilt. Seems as though “simple” is my only style these days. And stay tuned. I am pretty sure that I am not finished with this “Happy” phase. Guess it’s a series. Here’s an option for another, although I’m not completely satisfied with it yet. Must by why it’s not finished yet. 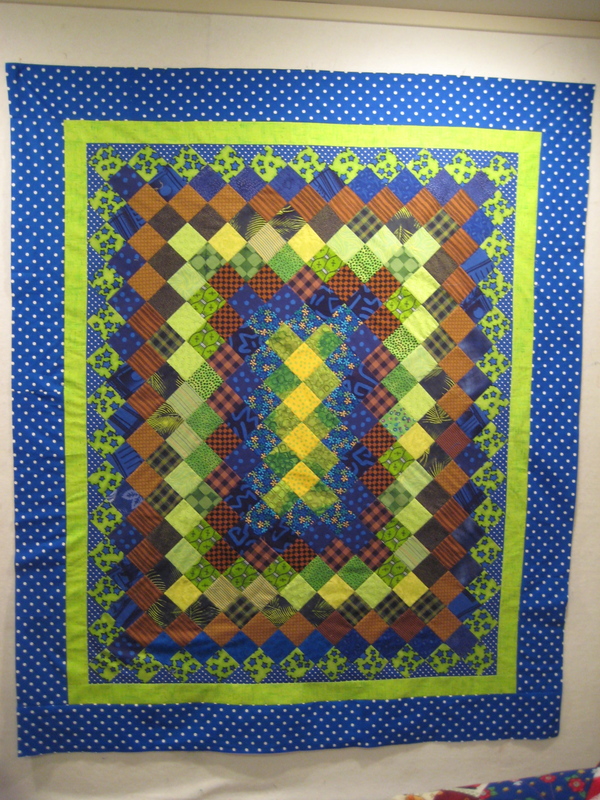 Another special piece from my vintage collection is this quilt done in the Triple Irish Chain pattern. Masterfully pieced, this quilt has many extras that make it stand out from others of its kind. 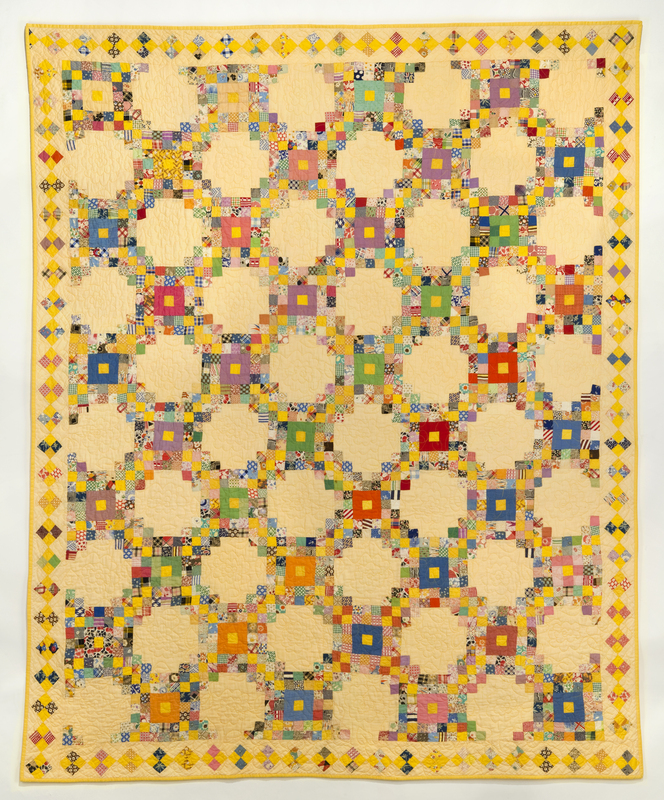 The solid fabrics in the centers of the pieced blocks add diagonal interest, as well as perfectly representing the reigning range of classic solid colors out of which many quilts were made in the 1930’s. And all these colors, along with the patchwork piecing, pop right out of the pale peach background. Helping with the diagonal focus are the solid bright yellow patches, strategically placed to run across the quilt, right through the middle of the solid blocks. If my eyes put the bright yellow right next to the pale peach, I see a dissonance, so I am quite impressed that this quilter could see that the finished quilt would be quite powerful using these two fabrics. These yellow blocks also form the center of the pieced borders, help to unify the piece, and create a fabulous spring/summer quilt. While looking through my old photo files for pictures of the Christmas stockings I had previously made, I came across a picture of a quilt that I had forgotten about. The picture is one taken for the EBHQ historian at the Voices in Cloth 2008 quilt show. I did not keep this quilt long enough for it to be professionally photographed. It was donated to a women’s clinic in Africa, when EBHQ still had a means of getting these items there. I also remember that this quilt was problematic in many ways. 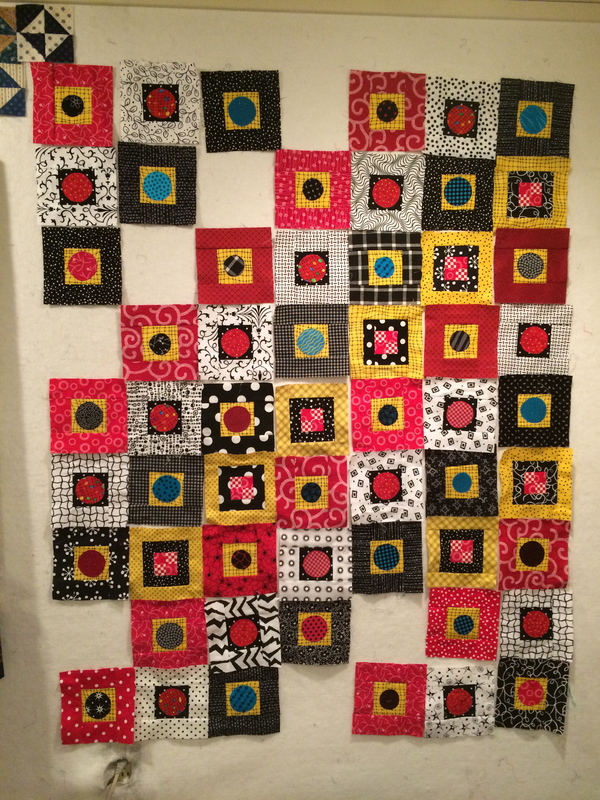 It started in an EBHQ workshop on color in quilts taught by Christine E. Barnes. She uses “mock blocks” to teach color and other artistic concepts to quilters. (see her book Color: The Quilter’s Guide for all the details) Below is the mock block I made in class, and I loved it. Time to make a full quilt. I changed the center square to a red-purple (magenta), creating a triad color scheme. Finding the turquoise, yellow-orange, and magenta fabrics for the quilt was difficult, especially when I needed them in different values. There was not much dark turquoise in the local fabric stores. Then, finding an appropriate fabric for sashing between the blocks was even harder, since I had boxed myself into this specific color scheme. I love the puzzle aspect of this art form, but this one was not so much fun. The sashing fabric turned out to be in my own stash; it was a fabric manufactured by the children’s clothing company Mousefeathers in Berkeley, and a wild print it was. Anyway, after struggling with finding fabrics, putting them together, working out the math, and developing a quilting pattern, I was happy to see this one finished, ready for display at the quilt show, and I loved it. But NO ONE else did. Too bright, unusual colors, whatever. So off it went to keep someone continents away safely bundled. Just for fun with the upcoming holiday—-some more postcards. 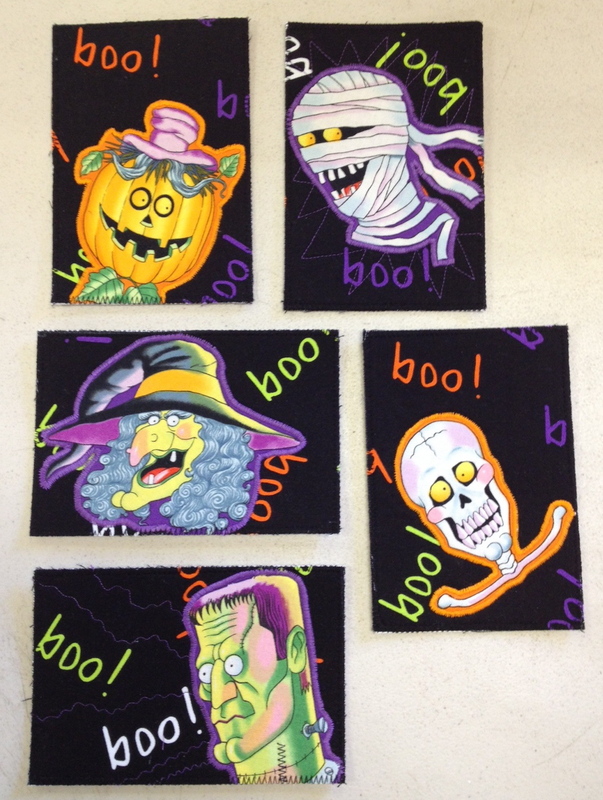 I loved making these from some old Alexander Henry fabrics I found heavily discounted after Halloween one year. Some of these images were incomplete, but they still worked in this small format. I even had to give the torn Frankie a few extra sutures on his neck; seemed to do the trick. As I make my plans for another visit to Sibila’s studio, I will show here a few quilts that were given away before I had the chance to have them photographed professionally. I’m so glad they are on their way to being wrapped around a special, appreciative someone. 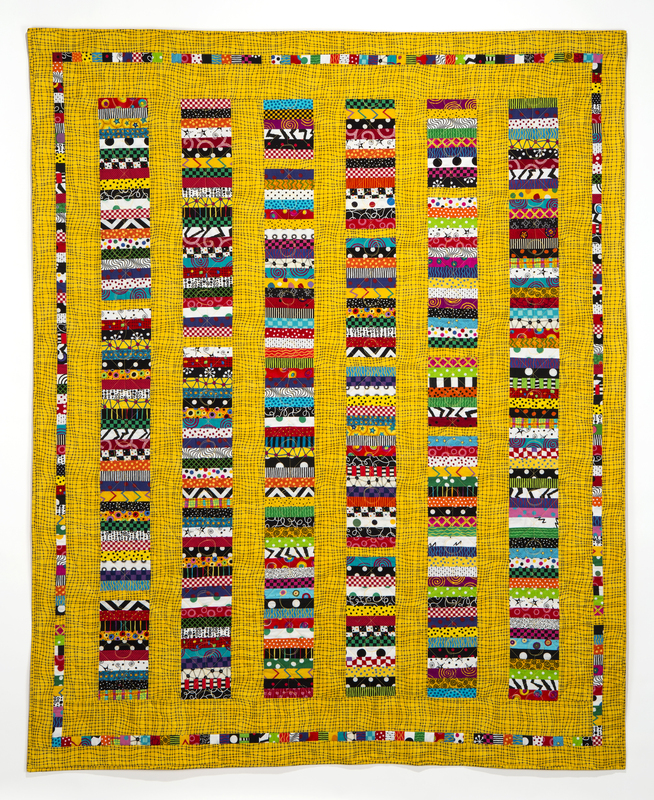 A Walk in the Garden, 2010-–I had fun making these crazy blocks from a collection of Jane Sassaman fabrics, and as soon as I did, I found it almost impossible to find a way to get them all into the same quilt comfortably. 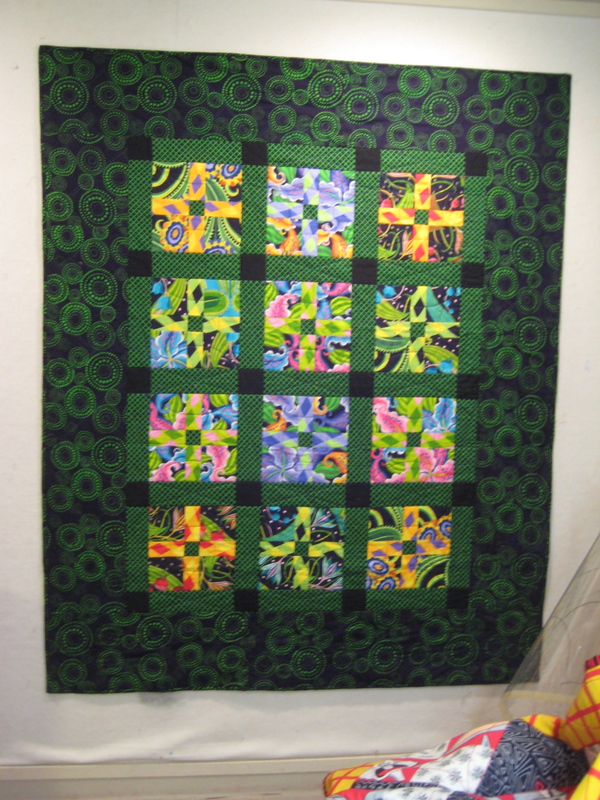 The crosshatched print was a great find for the sashing, and then this quilt waited a while until I tripped across the wild green and black print for the large borders. Garden of Blue and Green, 2010–I only got a picture of the finished top of this quilt, but I still thought it worth catching. This quilt was made entirely from the leftovers from the previous The Light Shines Through series (seen here), and using the brown prints really seemed to help the colors work well together. 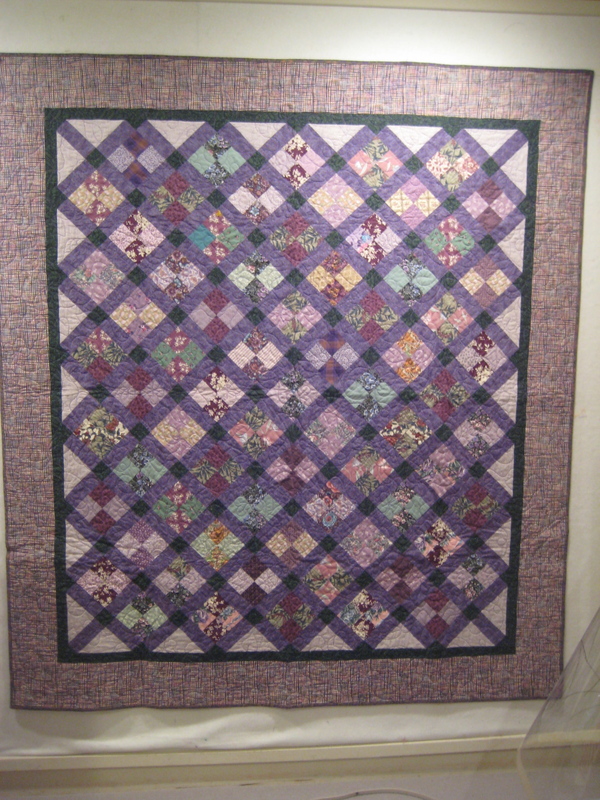 Lavender Garden I, 2004–Like its cousin Lavender Garden II (seen here), this quilt was made using the piles and piles of 2.5″ squares cut from the leftovers of various projects. This quilt came about just as soon as I found this wonderful grayed-out printed plaid border fabric. This border made it possible to include a wide variety of colors into the piece.